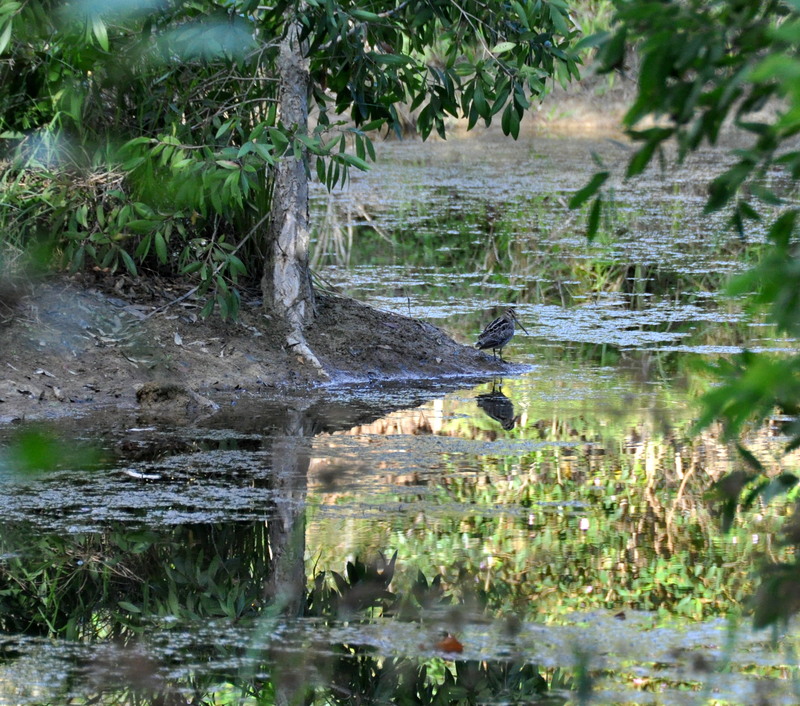 A quiet afternoon walk around the wetlands yesterday………. good for the soul and especially pleasing to see what I think is a Latham’s Snipe (I’m aware they can’t safely be identified from Swinhoe’s unless in the hand) enjoying the muddy banks on Fran’s Island. Our newest wetland, excavated in Oct. ’07 doesn’t have an overall name but the various sections and islands have names – Fran’s island is named for my Mother who was always enthusiastic about restoring land for wildlife. I’ve included this distant photo of the Snipe because it shows the bird in the landscape in a very characteristic frozen posture and also because I was very pleased with the reflections. It was impossible to be quiet as I moved under the trees, crunching on the leaf litter, trying for a closer photo but the bird relied on its amazing camouflage and only shifted slightly along the bank. Satisfied I had managed a few closer photos I retreated so that the Snipe could resume feeding and also before I lost my somewhat precarious footing on the muddy edge. I’m always tempted to think I can move out just a little further and that’s not a good idea when holding the camera! Just prior to setting off on my afternoon stroll Allen had told me that he had disturbed a Goshawk feeding on the remains of a Pale-vented Bush-Hen (Amaurornis olivaceus) along the track back from the orchard. So on my way down the hill I walked quietly past the area he had described but didn’t see any action. Of course on my return, excited about seeing the Snipe, I forgot all about the Goshawk until it flew up out of the sedge on the edge of the track. 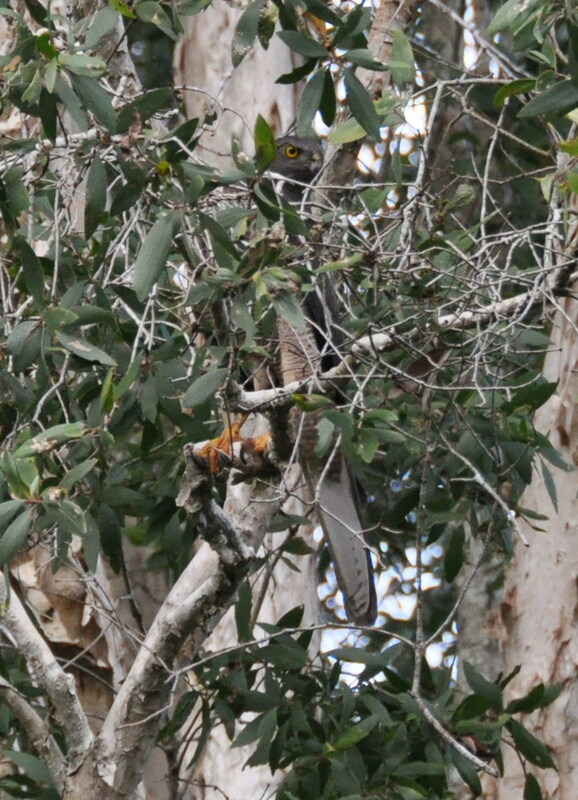 It turned out to be a Brown Goshawk (Accipiter fasciatus) and as it landed in a Melaleuca near by I clicked off a couple of shots – its not a great photo but I just love the intensity of that eye. 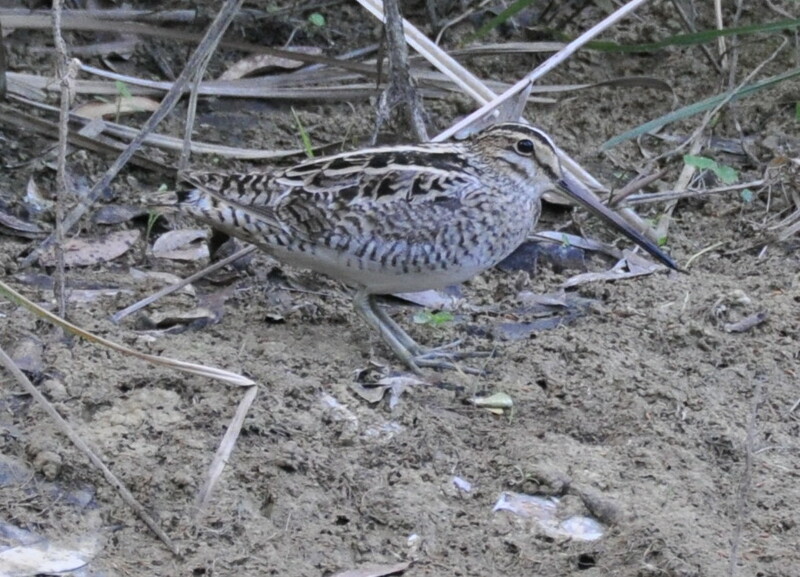 This entry was posted in Bird Observations and tagged Brown Goshawk, Fran's Island, Latham's Snipe. Bookmark the permalink. The photo of the Snipe and your wetland is beautiful! I love the reflections. Thanks Mick – we sometimes have to remind ourselves to take time to enjoy our own home environment! It doesn’t take long for wetlands to settle in up here, does it? What a lovely spot. Thanks Bronwen – Its been a fairly intensive management program of planting as well as weed control but we feel we’re winning now. Of course visiting water birds continue to bring in seed and not always desirable species so we do need to keep our eyes open. Only a wildly hopeful twitcher would not ID it as Latham’s. I’ve been puzzled at not seeing any yet near Ingham. Start of August usually brings a few in ditches alongside canefields. Thanks for the reassurance Tony.